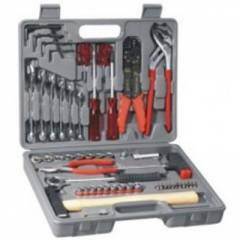 Contains Adjustable/Sli Wrench, L Handle, Nose Plier, Combination Plier, Water Pump Plier, 3 Screwdrivers Set, Wire Stripper, Cutter, Hammer, 3/8 Inch Ratchet Handle, 3/8 Inch Square Driver Socket Set, Hacksaw, Hacksaw Blade, Allen Key Set, Star T K.
I purchased attrico handtool kit from moglix online store, the toolkit I received was very handy, varieties of tools were in it which I generally use. High quality tools and especially screwdriver set and hackshaw. Impressed with the toolkit quality, will buy again from here. 0 of 1 users found this review helpful. Was this review helpful? Nice product with best price, attrico hand tool kit good product for home use, Very good purchase from moglix online store. i will definitely buy from this store again.